viaLibri ~ A Dry White Season. London: W.H. Allen, 1978. First edition of the author's most well known work. Octavo, original cloth. Signed by the author on the title page, who has added a line from this work, "We must endure, we must survive. Andre Brink." Near fine in a fine dust jacket. Jacket illustration by Bob Haberfield. Ben Du Toit is a white schoolteacher in suburban Johannesburg in a dark time of intolerance and state-sanctioned apartheid. A simple, apolitical man, he believes in the essential fairness of the South African government and its policiesuntil the sudden arrest and subsequent "suicide" of a black janitor from Du Toit's school. Haunted by new questions and desperate to believe that the man's death was a tragic accident, Du Toit undertakes an investigation into the terrible affaira quest for the truth that will have devastating consequences for the teacher and his family, as it draws him into a lethal morass of lies, corruption, and murder. 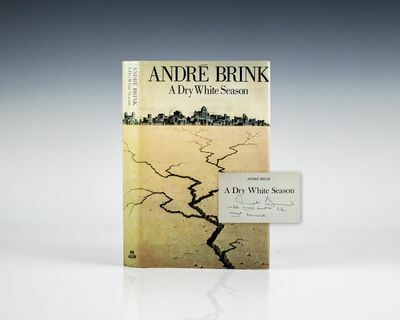 "Andre Brink's writing is built on conviction...A Dry White Season describes the triumph of tyranny" (The Times). Made into the motion picture bearing the same name starring Donald Sutherland, Susan Sarandon, and Marlon Brando.